IONiX play structures combine the beauty of an outdoor art installation with decades of scientific research to create a unique play experience. The challenging climbing activities in each outdoor play structure enhance a child's strength, balance, coordination and decision-making skills. The configuration of the components promote looping patterns of play, encouraging more activity and longer periods of play, and the translucent panels in the optional Shadow Play® Canopy capture the sun's light and disperse it along the ground as colorful shadows. As the position of the sun changes throughout the day, so does the position of the shadows. 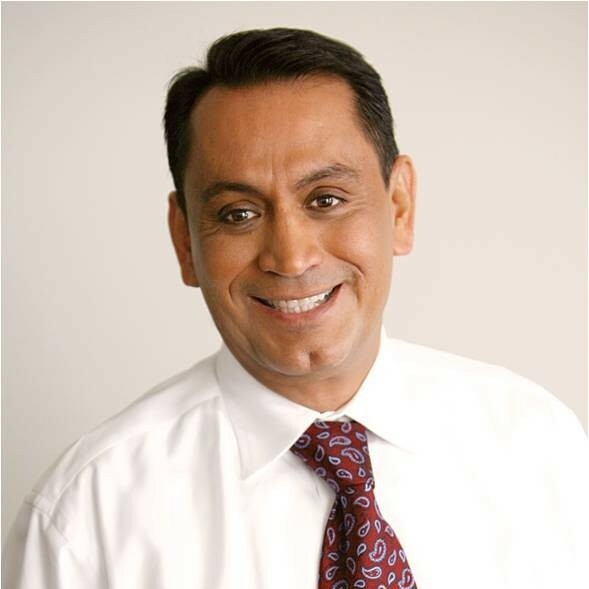 The result is are dynamic play systems that are continually changing, challenging and compelling. Gil Cedilla, Los Angeles City Council This is the first IONiX play system in the City of Los Angeles. It is an outdoor art form that promotes active and imaginative play for children of all abilities. The styling of IONiX play structures inspire young imaginations and spark creative play. 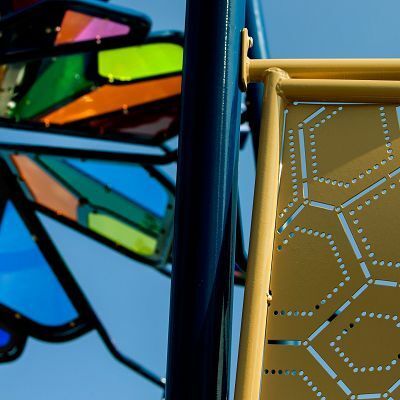 IONiX creates a stunning visual experience that draws families to your park since the play systems look like a modern art installation when children aren't at play. The advanced skill climbers and challenges on IONiX play structures provide physical, social and cognitive benefits along the developmental continuum and are perfect for older children who seek a more adventurous play experience. 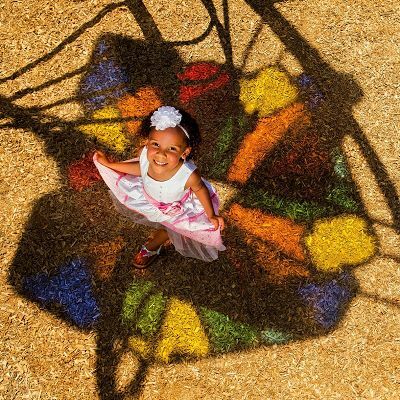 The Shadow Play panels on each outdoor play structure capture sunlight and disperse it below, transforming the ground into a vibrant, colorful work of art. As the sun changes position throughout the day, so do the shadows along the ground. 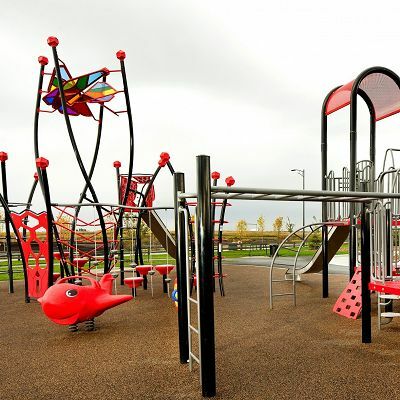 Combine IONiX with PowerScape or PrimeTime to extend the play value of your play area, appeal to older children and create visual interest that draws people to your park or playground. Designed to promote looping patterns of play that appeal to older children who are looking for more challenging activities. This outdoor play structure features the Catalyst Spiral Slide, Helix Tower with Shadow Play® Canopy and more! 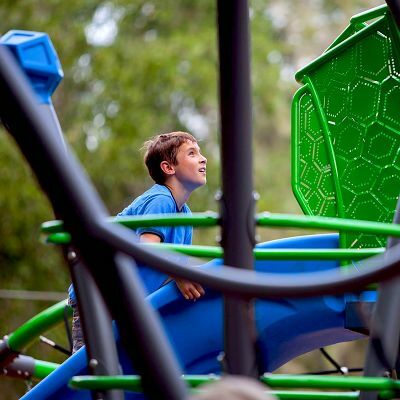 Look skyward and experience Shadow Play® with this exciting and artistic play system that features exclusive climbing activities like the TriNet and Splitter! Get children moving and keep them interested with exciting, challenging activities like the Jungle Vines, Ziggy Rail, Spiral Slide and more!